Born in Tokyo, Japan but raised in Australia, Kyla Matsuura-Miller showed a flair for music from a young age, which was encouraged by her parents; her mother, a talented pianist, and her father, an avid vinyl record player. Commencing her violin studies with Phillip Taylor in 2000, Kyla is today in the advanced performance stream under the tutelage of Michele Walsh, and was awarded her AmusA with Distinction in 2007. 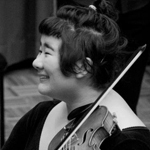 She has participated in many orchestral programs, both state and nationwide, including the National Music Camp program with the Australian Youth Orchestra from 2009 to 2013 and in 2013 has accepted offers for both seasons of the AYO, including the European International Tour, as well as Chamber Players, and an internship with the Tasmanian Symphony Orchestra. She is also a very active freelance musician in Brisbane, appearing in many bands and chamber music concerts with other Brisbane-based and Australian artists. Holding a keen interest in new music, she has premiered many solo and chamber works from emerging composers in Brisbane, such as Chris Healey, Jake Bragg, Michael Bakrnchev and Samantha Wolf, and in 2013 has premiered works by James Ball and Ryan Walsh, most notably recording a solo viola and piano piece for upcoming film "The Turning" starring Hugo Weaving, amongst other prominent Australian actors, as well as his first string quartet. Kyla has received masterclasses from world-renowned performers such as Peter Wispelwey, Anna McMahon, the Pacifica Quartet, Lambert Orkis, Graeme Jennings and Alvaro Palmen. 2012-13 highlights include collaborations with Clocked Out and a performance of John Cage's concerto for prepared piano, featuring soloist Erik Griswold. Solo engagements for 2013 include performances with Brisbane Baroque Players in July.